Wrinkles in wall-to-wall carpet don’t just look bad, they can be a tripping hazard. They’ll also wear out first, so they’ll really never go away unless you fix them. Improper installation is what causes carpets to wrinkle. Carpet has to acclimate to your home’s temperature before it goes down, and it should always be installed with a stretcher. Stretchers look a little like large sponge mops, but the head is covered with sharp teeth to grip the carpet; a lever moves the teeth to stretch it. To fix a wrinkle, you can rent a carpet stretcher and a knee-kicker for around 40 bucks and adjust its tooth depth to the depth of the pile of your carpet. Pull the carpet up from the tack strip at the baseboard, then sink the teeth of the power stretcher into the carpet where you need to pull it taut. Use the lever to stretch out the wrinkle. Then, use the knee-kicker on either side of the stretcher to fasten the carpet back onto the tack strip. 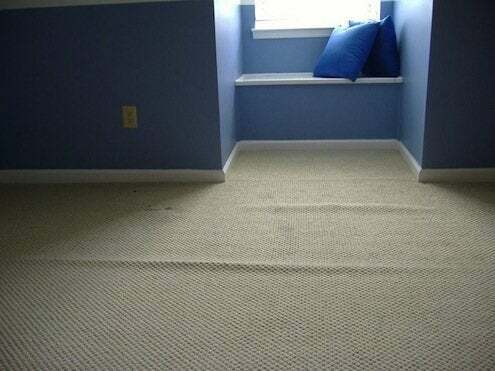 Curl the excess carpet at the baseboard toward you and trim it from the back with a carpet knife.